View / download the Big Picture here. I particularly like the way the new skyscraper in Naka Meguro stands out, with its two little ears (which are actually cranes). Thanks to Orchid64 and CherrySherbet for the kind comments that prompted me to do this! 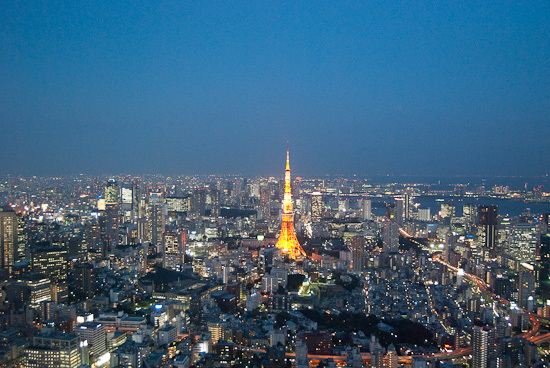 These were taken from the roof of the 53-storey Mori Tower, Roppongi Hills. 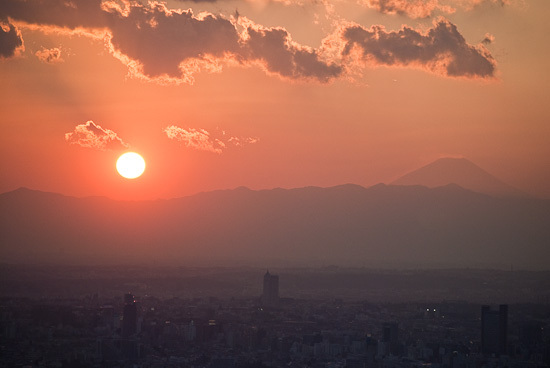 You can just see Mount Fuji poking up above the horizon in this one. Yesterday was a pretty good day. 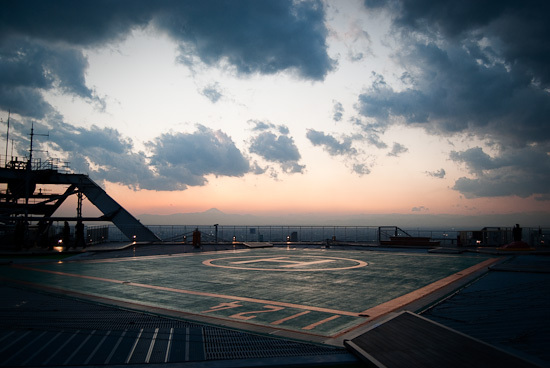 My MacBook was returned after its third major operation, and late in the afternoon I was able to spend a couple of hours on the roof of the 53-storey Mori Tower in Roppongi, watching the sun set. It was marred by two things though, the first of which was my being told by the local pensions office that I need to pay all contributions that I missed whilst I was not working in Japan (between 2002 and and 2008). This is for a pension that I won’t even be claiming due to my not being here at that age. The second was my being told to leave a barber shop because I’m a foreigner. This took me completely by surprise. I’d gone in and asked the owner (in Japanese) if he could cut my hair despite my not having a reservation. His reaction was simply to point to the door and tell me to leave. Confused, I asked him “Oh, aren’t you open?”, to which he mumbled something under his breath …before gesturing for me to leave again. I left. Standing outside I looked at all the signs – no, they were open. There was one customer inside, and three staff – the owner and the second staff member were sitting watching TV – waiting for customers. The owner wouldn’t look me in the eye, and just said “Please leave”. I turned to the woman beside him, and asked politely, “what’s the problem here?” She seemed to feel a bit awkward. Gesturing towards the owner she told me, in English (and bear in mind that I had used no English whatsoever) “We no English”. Thinking that she must have learnt that line for situations such as this, I replied, in Japanese, that that wasn’t an issue, as I could speak Japanese. Silence. Then the owner told me to leave again, this time kindly opening the door to facilitate my quick exit. Walking towards home I felt pretty pissed about this. I considered reporting them to the police, but looking at the time I decided I didn’t want to waste my afternoon trying to change the opinions of others. Since I twittered about this I’ve had a few comments (mostly on facebook) from others who’ve experienced such discrimination themselves. Whilst of course I was aware that this is by no means unknown in Japan (and think of the famous Otaru hot spring law suit in which the Supreme Court, i.e. the highest court in Japan, ruled in favour of the owner of a spa who banned customers that didn’t look Japanese), I am still very surprised to find the no-foreigner policy being practiced here in the centre of Tokyo. Tonight, I’m going to get my hair cut by a friend. He is not afraid of gaijin lice. 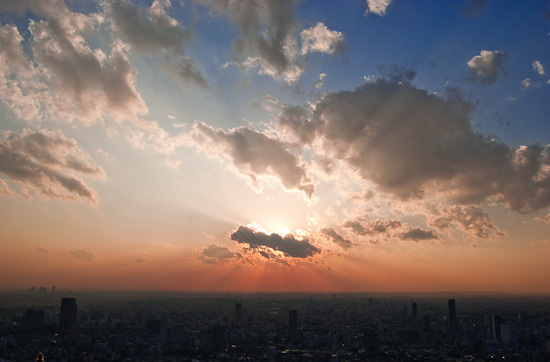 [Update] A recent article on this subject in the Japan Times has gained widespread attention. Check it out here. Also, see Black Tokyo’s take on the article. Last night’s weekly tandem learning session, in which I teach my friend English for an hour in exchange for her (a qulaified teacher) teaching me for an hour tunred into a session for us to express our mutual frustration at not being self-disciplined enough to make much progress in our studies. For me, the main issue is not that I am inherantly lazy, but that I have so many other things I want to do more. Japanese study often gets pushed to the back burner, only coming into focus in those situations when I find myself struggling to communicate some idea and become ‘angry’ at myself for not trying harder. Learning Japanese is Important but not urgent, and thus tends toget sidelined by things that I perceive to be urgent, but that in the long term are not all that important [Time management matrix]. My friend, having recently returned from the UK to visit my classmate Phil, had already decided to take action. She will be going to work a little earlier every morning to study. I’ve decided to do something similar. I’m going to get up at 6am every day between now and February 28th. The 2 or 3 hours I have between then and when I leave to work (it differs depending on the day) will be filled with a combination of study, exercise, and time spent on my projects. Every night I take out the beautuful little handmade notebook given to me by a friend, and write down all that I’ve acomplished that day. I then write down my goals for the next day. Whilst today is only day one, I:m already delighted by the results. This morning, I spent an hour studying the text books I bought ages ago, I transferred the acompanying CD onto my iPod, did a good workout (pressup and situp reps), and then had a relaxing bath. I’ve had time to eat breakfast, and am even able to get a quick blogpost out. The sense of accomplishment and satisfaction is delicious. I’m giving this routine the label ‘experiment’ and setting an end date of February 28th . It’s important that that I have a time limit, a goal to work towards, to prevent my trailing off.